Ningxia, in the middle Yellow River valley in northwest China, was set up as an autonomous region in 1959, covering an area of more than 66,400 square kilometers. Ningxia can be divided into two geographical sections according to terrain. The southern section, generally 2,000 meters in elevation, is part of the Loess Plateau with the Liupan and other ranges as the main body. The northern section is the Ningxia Plain formed by the Yellow River alluvial deposits. With the Yellow River flowing through it, the Ningxia Plain is the major farming area of the autonomous region. Nlngxia has a marked continental climate. It has a mean annual temperature of 5-9oC and a mean annual precipitation of 180-680 mm. It is divided into 4 prefecture-level cities, 2 county-level cities and 14 counties, with a population of 5.62 million as of 2000, one third of which are Huis and the rest are from the Manchu, Mongolian, Tibetan and Han ethnic groups. Roast lamb, handpicking mutton, sweet and sour fish and the Huis' special food, etc. Xintianyou (a folk song genre which originated in North Shaanxi), Hua'er (a folk song genre popular in Gansu, Qinghai and Ningxia), etc. Ning is the short shortened form for the Ningxia Hui Autonomous Region, with Yinchuan as its capital city. The Yellow River flows through its northern part. It has a long history of diverting water from the Yellow River for irrigation. As far back as some 2,000 years ago, the people in this area had taken advantage of the unique natural conditions to dig canals to divert the water into farmland. There are crisscrossed irrigation channels, the fertile soil, high yield rice and wheat, delicious and sweet watermelon and fruit on the Yinchuan Plain. These make the Yinchuan Plain known as "the lush southern-type fields in the northern frontier; land teeming with fish and rice". The resources of coal and gypsum hold an important position in China. The vast area of Northwest China has attracted both ancient traders and modern tourists. Ningxia Hui Autonomous Region, called Ning for short, the region with its vast desert is located on the upper reaches of the Yellow River. During the time of the Han through Tang dynasties (206 B.C.- A.D. 907), Ningxia was the main route for trade and transportation between eastern and western China. Ruins of the Great Wall of the Ming Dynasty (1368-1644) can still be found in east Ningxia. Here, we zero in on Ningxia's Helan Mountain rock drawings and the singing sands of Shapotou. Where the Yellow River meets the southern rim of the Tengger Desert, the sand stops and the Shapotou area begins. In Shapotou, the desert has built up the 2,000-meter-wide, 100-meter-high sand dune known as Golden Bell of Resonant Sand, one of China's four singing sand dunes. Sliding down on a board, especially in hot weather, can create a reverberation like the sound of a huge bell or drum. Looking up from the foot of the sand mountain, sand sliders appear to be descending from the sky or from a waterfall. For those afraid of heights, take the cable car down, drag the board up halfway, and slide down, or just watch from below. Sand Lake Scenic Resort is known for its lake, sand dunes, birds and fish. During the May-September period, the lake is home for a dozen varieties of birds, including swans, white and gray cranes, black storks and wild geese. Shapotou is also home for the Desert Research Center, established in 1956 to find ways to keep the sands from encroaching on the Baotou-Lanzhou railway, which runs through the Tengger Desert. With its natural beauty and ecological achievements, Shapotou has won the title of "world's sand capital." The Yellow River winds through Ningxia for about 400 kilometers, the region's main source of irrigation. One of the most traditional ways of experiencing the Yellow River at Shapotou is on a goatskin raft. The raft floats on 14 pieces of goatskin pumped full of air. As recently as the 1960s, this was the major way to cross the river. Don't shy away from the rafting just because it's a tourist must-do. Sitting on this simple goatskin raft and listening to the folk song "The Yellow River Has 99 Bends," you may think there is no better way to connect with the river. 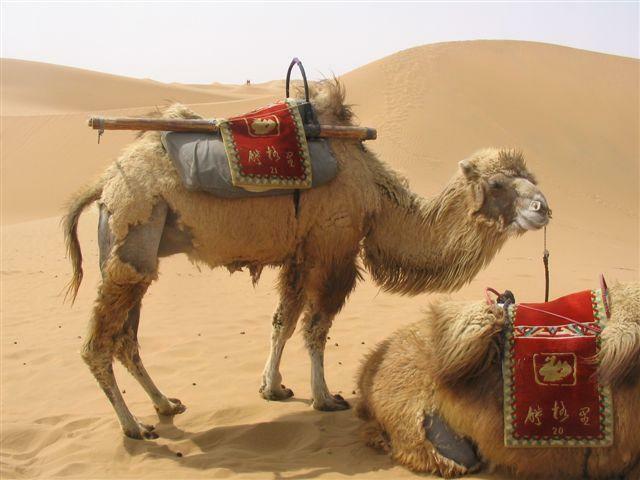 The local people offer camel rides in the desert, bonfire parties, picnics, barbecues and fruit picking. 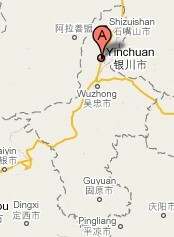 Take a train from Yinchuan to Zhong-wei County and transfer to a bus to Shapotou. Helan Mountain, located in the northwestern part of Ningxia, ranges for more than 250 kilometers. Once a nomadic area, since ancient times, the mountain has been inhabited by various ethnic groups - Xirong, Xiongnu, Xianbei, Chile (here Chile refers to a place in northwest China), Tujue, Huihu, Dangxiang and Mongolia. The mountain is home to more than 1,000 cliff carvings created some 2,000 years ago. The drawings are scattered over an area stretching several hundred kilometers, on both sides of a 600-meter-long ravine on the eastern slope of Helan Mountain. The location is some 50 kilometers from downtown Yinchuan, capital of Ningxia. The drawings carved in rock were done by different nomadic groups as early as the Shang and Zhou dynasties (1600-256 B.C.) and as late as the Western Xia and Yuan dynasties (1038-1368).